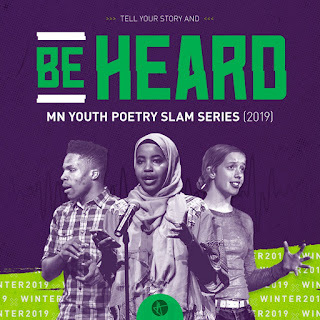 The 7th Annual Be Heard MN Youth Poetry Slam series wraps up on Saturday, March 30, at SteppingStone Theatre in Saint Paul. Here's a link to reserve tickets. I work with TruArtSpeaks and spread the word about Be Heard every year, and Finals is always an incredible show, an opportunity to not just support young people, but also witness some of the most dynamic, forward-thinking writing and performance art our state has to offer. This year will be no different... but it also will be. It's always the right time to listen to youth, but these past few months have really driven that point home in a powerful way. I got to host the last semifinal bout in this year's Be Heard series; this was just a day after a white supremacist murdered 49 people in New Zealand. That juxtaposition got me thinking, more than usual, about the importance of storytelling, about how narratives are controlled and spread, and about what power we have to shift dominant narratives. From mass shootings to climate change to racial justice to education and beyond, young people are either at the forefront of our movements, or deserve to be. Be Heard has always been a platform for that particular truth, something that is bigger than poetry, bigger than "celebrating" youth. This is movement-building work. The stage is a big, open, public space for people to tell their stories, to present counter-narratives, and to build community. So if you can make it, I'll see you there. 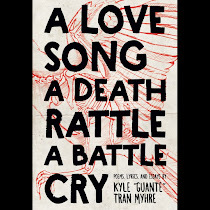 If you can't, but you're still interested in this kind of thing, please check out my big list of local open mics, slams, and workshops; in particular, I always shout out TruArtSpeaks' ReVerb open mic. It's every Thursday, 6-8pm, at Golden Thyme Cafe in Saint Paul. That open mic is free and all-ages.